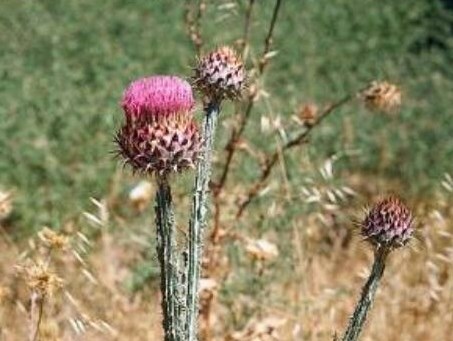 Onopordum illyricum (Illyerian thistle) is a biennial herb/ (family Asteraceae) with purple flowers and prickly toothed leaves found in the central coast ranges of California. It is native to southeastern Europe. It favors grasslands and riparian and bottomland habitat. It spreads via seeds equipped with fine hairs. The seeds spread via wind, water, wool, vehicles and clothing.